WASHINGTON, DC, February 13, 2015 (ENS) – The first genetically engineered apples were today approved for planting and sale in the United States by the U.S. Department of Agriculture. The two approved apple varieties are genetically engineered to resist browning. They were developed by the Canadian company Okanagan Specialty Fruits Inc. and will be marketed as the Arctic® Granny and Arctic® Golden. Under the Plant Protection Act, APHIS is required to evaluate whether a new genetically modified plant, such as these apple varieties, are a plant pest risk to agricultural crops or other plants or plant products. If APHIS finds that a new GMO is unlikely to pose a plant pest risk, then under the law, the agency must deregulate the plant, allowing its sale and planting. Consumers will have to wait a little longer, though, since apple trees take several years to produce quantities of fruit. 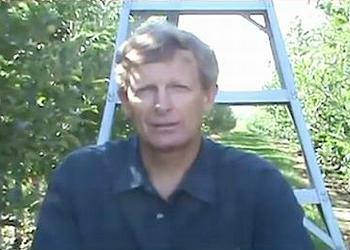 “Our focus is working with growers to get trees in the ground. As more trees are planted and they come into commercial production, there will be a slow, but steady market introduction,” Carter explains, estimating Arctic apples will first be available in late 2016 in small, test-market quantities. Here’s how it works. When you bruise, bite or slice an apple, rupturing its cell walls, a chemical reaction that turns the apple brown occurs between an enzyme in the apple known as polyphenol oxidase, PPO, and antioxidant compounds in the apple called phenolics. Okanagan Specialty Fruits’ team turned down the expression of the apple PPO genes in a process called gene silencing, which utilizes low-PPO genes from other apples. In the end, Arctic apples produce too little PPO to brown. The transformed Arctic apple plantlets are grafted onto rootstock and grow in a tree nursery until they are transplanted to an orchard, just as other commercial apple tree seedlings are propagated. 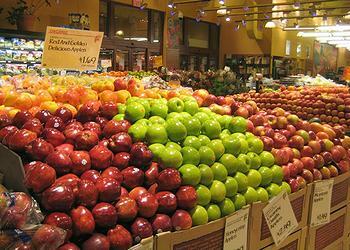 Some consumers like the idea of non-browning apples. In October 2014, Okanagan Specialty Fruits issued the results of a mall intercept survey in which consumers shared their thoughts on the benefits of non-browning apples. A cut Arctic apple can be refrigerated in a zip-lock type bag for several days without any noticeable browning, said 86 percent of respondents. Nonbrowning apples save consumers money, since these apples are eaten instead of being thrown away when they turn brown, said 85 percent. Freshcut Arctic apple slices won’t require treatment with lemon juice or chemicals to prevent them from browning, said 84 percent. But not everyone likes the idea of genetically engineered apples, particularly if they are not labeled as such. On Thursday, three Democrats – U.S. Senator Barbara Boxer of California, U.S. 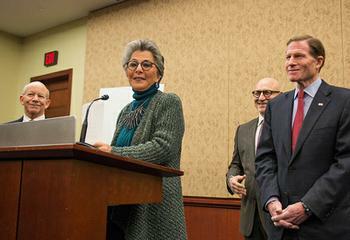 Senator Richard Blumenthal of Connecticut and Congressman Peter DeFazio of Oregon – joined with Chef Tom Colicchio at a press event in the Capitol to introduce the Genetically Engineered Food Right-to-Know Act. The bill would require the U.S. Food and Drug Administration, FDA, to clearly label genetically engineered foods so that consumers can make informed choices about what they eat. “Consumers have a right to know what is in the foods they eat and parents have a right to know what they are feeding their families,” Senator Boxer said. “As a consumer and dad, I want to know whether my family is eating food that has been altered artificially in genetics – and the American public wants and deserves to know as well,” Senator Blumenthal said. The FDA currently requires the labeling of over 3,000 ingredients, additives and processes, including labels for juices made “from concentrate,” but the agency has resisted labels for genetically modified foods since 1992, claiming that these foods were not “materially” different from other foods because the genetic differences could not be recognized by taste, smell or other senses. The lawmakers and chef Colicchio object that the FDA’s labeling policy has not kept pace with 21st century food technologies that allow for a wide array of genetic and molecular changes to food that cannot be detected by human senses. According to surveys, more than 90 percent of Americans support the labeling of genetically engineered foods. In fact, many consumers are surprised to learn that genetically engineered foods are not already labeled. This bill would make permanent the voluntary labeling system now in place and prevent the FDA from ever requiring GMO labeling in the future. H.R. 4432 is backed by Monsanto, Dow Chemical, the Koch Brothers and food companies such as Pepsi. Since 2012, big food and chemical companies have poured more than $100 million into fighting GMO labeling initiatives in California, Washington, Oregon and Colorado. 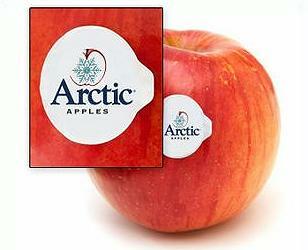 Arctic apples will be labeled, but the labels will not say the fruit is genetically engineered. Okanagan Specialty Fruits Inc. is currently engaging in a voluntary food safety assessment consultation with the Food and Drug Administration regarding its Arctic® Apples. Other nonbrowning Arctic varieties of fruits, such as peaches, are expected to follow. Carter says it will take “many years” before nonbrowning Arctic fruit is widely distributed.